When it comes to high definition television production, the Panasonic AG-HPX500 is a video crew’s best friend. Using a P2 card instead of tape to store video, the AG-HPX500 supports 32 HD/SD recording formats in both NTSC and PAL. High definition formats include 1080i and 720p and standard definition formats include DVCPRO50. The AG-HPX500 also shoots video in variable frame rates and has a great film look with a variety of 24 frames per second configurations. The versatility of P2 media makes shooting high definition television programs a reality for nearly every production company. Before HD video production begins, the producer specifies a high definition video format, for example 1080i, and the director of photography sets the AG-HPX500 to capture video onto the P2 card in 1080i format. When the HD TV crew is finished shooting, the data-HD video – on the P2 card is transferred from the AG-HPX500 camera to a portable hard drive that is smaller than a Betacam tape. The portable drive can be shipped or carried on a plane with the producer. Once your editor has the P2 media, the video files can easily be uploaded into Final Cut Pro, Avid and nearly every other major editing program that supports HD and edited just like any digitized clip. When your high definition project is completed, it can be digitally cut to your high definition deck, burned to Blu-ray or exported to a portable drive as a QuickTime movie and laid to HD video tape at your favorite dub house. 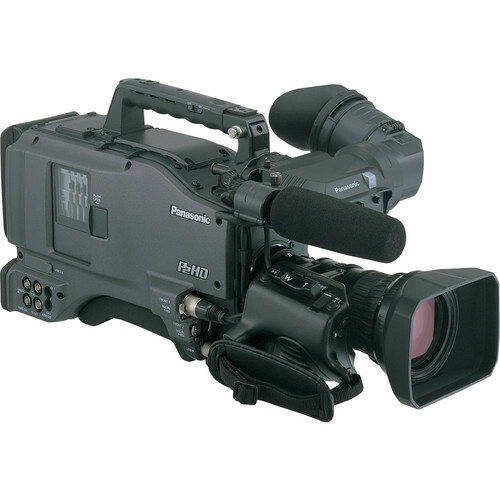 The video quality of the Panasonic AG-HPX500 is stunning, especially in the high definition formats and with the flexibility that P2 video allows, nearly every television production company can provide their clients with spectacular HD video today! Back to Video Production Equipment.